Cast of Haskett point that tested positive for elephant. 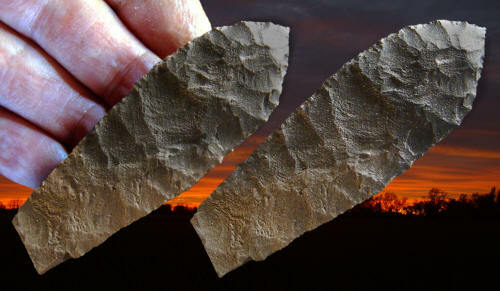 This point was discovered during an archaeological survey in the Great Salt Lake Desert in western Utah. It represents one of the earliest forms of western stemmed points and appears to date sometime prior to about 12,000 calibrated years before present based on its context. These types of spear points are now believed to have been used to hunt large mammals during the late Pleistocene. This point was tested for protein residue and was found to react positively to elephant antisera (blood serum), presumably mammoth or mastodon. It was found within a geological formation known as The Old River Bed which is an abandoned river delta that flowed onto the floor of the Great Salt Lake Desert and, for some time, into ancient Lake Bonneville. The base was broken with a bend-break type of fracture that also caused burin flake removals on both edges. This Haskett point is made of black basalt and it measures 3 3/8 inches (8.6 cm) long.